One of the blessings of having a family member on Martha's Vineyard is that it is a beautiful place to visit and the welcome mat is always out for Mom! I hope to visit my middle daughter on the island in September once my youngest is off to college. 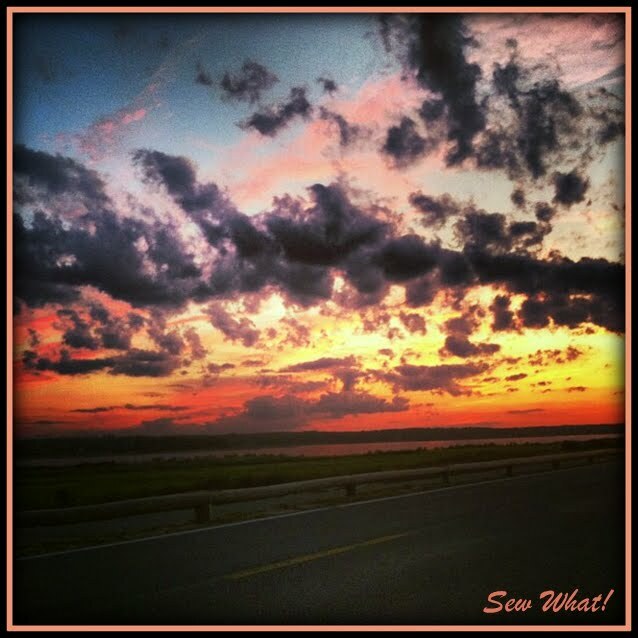 I have posted images of sunsets on my sidebar of some favorite sunsets I have seen on Martha's Vineyard. I even promised that the third sunset photo on my sidebar would be the last I would post. I lied. My daughter snapped this amazing sunset on her phone and she posted it to Facebook. When I asked her if I could steal it for my blog, she told me she had a few more photos on her phone that she could send me. Sunburst! This sunset looks like the sun exploded as it sunk into the ocean! Here is my favorite! Shades of blue, purple/lavender, peachy oranges and yellows.....I do love the colors of the evening sky! Thanks Em for sharing some of the Island sunsets with me until I can get there and see them for myself. Until I get there, keep your phone handy! I may have to add these to my sidebar under my favorite things! "There's a sunrise and a sunset every single day, and they're absolutely free. Don't miss so many of them!"